Brand New popular Islamorada model by Breakwater Construction. 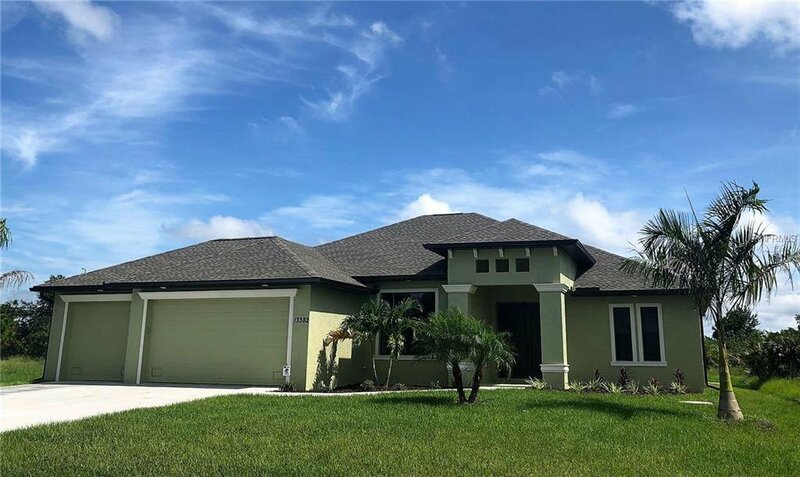 This 3 bedroom 2 bath 3 car garage pool home sits just within South Gulf Cove and features a split bedroom great room floor plan with volume ceilings, crown molding and wood plank tile throughout. The Great room opens to the large lanai and pool area (pool deck is 55x20 spans the entire rear of home), kitchen features include shaker style cabinets, slate appliances, large flat island, granite, under cabinet lighting, tile backsplash and pantry, the master bedroom has pocket sliders to the lanai, his and her closets, his and her vanities and glass enclosed shower, Guest rooms close off with pocket door for privacy and hall leads to lanai for pool bath access. Other features include Impact resistant windows (except sliders on lanai), security system and irrigation. Listing courtesy of BREAKWATER REALTY GROUP LLC. Selling Office: BREAKWATER REALTY GROUP LLC.